Motah (pronounced distinctly Mo-tah) is an interdimensional code name for a segment of the solar system government’s information sources. This blog chronicles the spiritual diary, channelings and commentary of Phillel, Coexecutive Director of Mark-Age. Because of his training with the Motah Council in this solar system for many thousands of years, Phillel also is authorized to use the name Motah as a code for his high Self functions. For background information, see the article Motah Retrospective. Bio: Phillel (Philip J. Jacobs) is also Managing Editor of Mark-Age. Born in Lufkin, Texas, on November 23, 1951, he was an Eagle Scout. He graduated Phi Beta Kappa with a B.A. in French and English from the University of Texas at Austin in 1974 and immediately joined the Mark-Age staff. 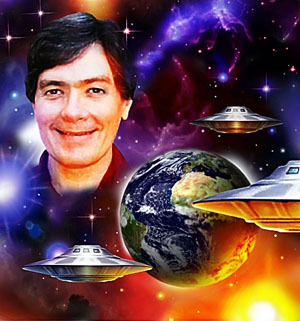 In addition to his skill as an editor, he is an expert researcher, author and lecturer on both spiritual and scientific aspects of extraterrestrial contact. His knowledge of close encounters spans historical, biblical and modern accounts. 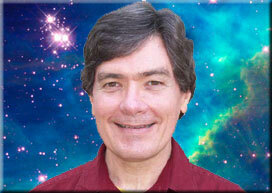 As a psychic channel trained by Nada-Yolanda, he is personally experienced in methods and purposes of spiritual space contact. 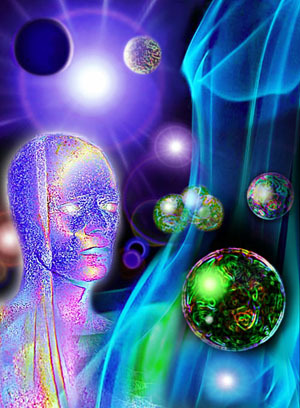 He serves as an interdimensional communications channel and as a hieronics channel, broadcasting transmissions of higher-plane electromagnetic energy from etheric spacecraft for spiritual transmutation. Download Motah Communiques 2007-15, a free e-book of hierarchal messages received from ascended masters and space visitors. 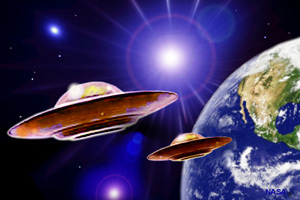 Phillel, a private pilot, has a unique ability to serve as a bridge between spiritual and physical aspects of extraterrestrial contact. In his many articles and cassette tapes, he explores the message of our space brothers, their purpose in communicating at this time, and how we can cooperate in their mass landing attempts. 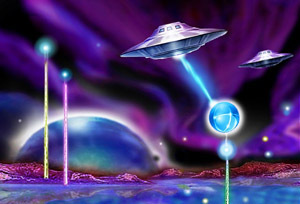 Phillel’s best-known works on the spiritual space program are the booklet Landing Light: A Primer for Space Contact and the audiocassette series Teachings of Federation of Planets. Click Landing Light to download the free e-book or to read the manuscript on this blog. See also his two-part article Hieronics. Masthead credits: Collage by author. The background image of the Magellanic Cloud is courtesy of NASA. The gold spaceships are courtesy of the extraordinary Australian artist Hartmut Jager, whose inspirational artwork appears throughout Motah Chronicles, including in the box links below and in the “Motah Retrospective” box on the sidebar of the home page.